For the past couple of weeks I’ve been craving big, crunchy, bakery style peanut butter cookies. Unfortunately, the only big peanut butter cookies that were coming out crunchy were my Monster Cookies. I gave up for a while, then remembered I had some bread flour in the pantry and that bread flour usually produces thicker, crunchier, cookies. Using the bread flour, melted butter and loads of peanut butter did the trick! To make the cookies a little more interesting, I added a big handful of toffee bits (Bits of Brickle), which give the cookies a little extra sweetness and crunch. As of now, these are my favorite peanut butter cookies (though that could change any day and probably will). 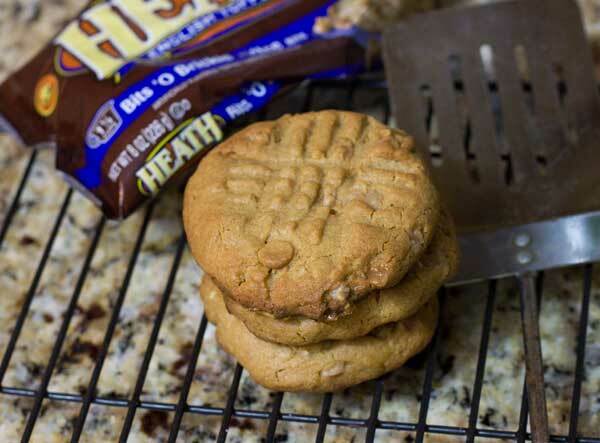 If you make them, be sure to add the peanut butter chips. The toffee bits are optional, but I think the texture of the cookie necessitates some peanut butter chips to offset the natural dryness that occurs in peanut butter cookies. Oh, and about that crunchiness. One of my batches was crunchy through and through, which was fine with me. If you like soft centers and crunchy shells, just take them out of the oven a little sooner. Melt the butter in the microwave or in a saucepan and let it cool down a bit. Mix together the flour, baking powder, baking soda and salt and set aside. Combine the melted butter, and both sugars in a large mixing bowl. Stir well, then stir in the peanut butter, egg and vanilla. Add the flour mixture and stir until blended, then stir in the peanut butter chips. At this point, dough should be stiff enough to mold, but if it's not, chill it for about 10 minutes. Scoop up large balls of dough (a little less than 1/4 cup each) and put on two plates or a large cookie sheet. Shape into neat balls, then use a fork to make a criss-cross pattern so that you have thick discs with criss-crosses. Chill for an hour or until cold and stiff. Preheat oven to 375 degrees F. and line two baking sheets foil. Arrange six criss-cross discs on each baking sheet and bake one sheet at a time on center rack for about 14 minutes or just until edges start to brown. Let cool on baking sheets for about 5 minutes, then transfer to a rack to cool completely. In my opinion, these are best when they are completely cool and crisp. If your butter is too warm, the dough might be a little soft. If your dough is too soft to work with, just chill it for about 10 minutes. For the peanut butter, use a mainstream type such as Jif of Skippy Natural with chunks. Stir of sift the flour before using OR just weigh it. Using too much flour will definitely give you a dry cookie. Stephanie, these were really good. Since I rarely have the brickle on hand, I usually make the other one. ‘ve never tried browned butter with peanut butter. If you try it, you might need to add a little extra water to the dough because the butter might lose some moisture as it browns. I am excited to try these. I have never used just bread flour in a cookie recipe (though my favorite choc. chip recipe uses cake and bread flour). I am learning a lot reading your posts and recipes. Thank you! My son…. sitting across the room from me as I type would LOVE these! I however am “cookied out”. For me just what the doctor ordered is clementines and almonds. Actually I’ve been craving something salty too. I’ll keep these in mind the next time I’m ‘needing’ a PB cookie fix.